Well, the day arrived and Bonnie Petersen and Bonnie Miyamoto and I took my little red truck and headed up the road to Tustin. We met in a parking lot at 5:45am and off we went. The clouds were dark and the weather cool. We got there easily and were directed to our spot by Dianne of Whimzy. We started unloading and setting out our items. The clouds decided to drizzle a little on us and then come down a little harder. Bonnie P. had packed some plastic sheets (thank you Bonnie) and we covered what we could and stood in a huddle under our umbrellas. Now the California rain did not deter shoppers who came and peeked under our plastic and even bought from us as it rained. It finally stopped and we uncovered and went about our business meeting other vendors and nice shoppers. Then a little more rain, a little more plastic. by 10am the clouds rolled on thru and the sun came out brilliantly. All and all it was a fun and a good day. We met fun people and learned lots of secrets of selling and even booked a date for the May fleamarket cause we are a gluten for punishment....not really we know May will be nicer weather.....won't it??? Here's a few pics I took with my iphone. As I told you in my last post, we're gearing up to sell at the Jamestown FleaMarket Sunday, March 27. 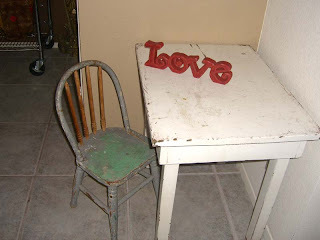 Now I love to go to Flea Markets, Urban Barn, Chateau de Fleur, Glitterfest and look and be inspired and YES buy! So I think, Hey I got STUFF...I want to sell it, I'll do one of these shows. Geez, I've been gathering and working on this for a few weeks. At least I'm "staging" (that's the slang in the business for setting your STUFF up prior to a show to see how looks....or that's what I call it :} and it's HARD to put lots of STUFF on a table and make it look pretty and then figure out prices. I know it's not gonna be fun packing the truck either ha ha But it will be fun selling with my friends and seeing what sells and what doesn't and see if this is something I want to continue to do. If it's not raining and you want to have a day out with girls, stop by and see us. I'll let you know how it goes. The two Bonnie's and myself have decided to sell at the Jamestown Village Fleamarket in Tustin March 27th. A couple months ago we took a trip to Matilda's Mouse and stopped at a little antique store and found a old oak chest. The price was right and we decided to buy it and give it a new life with a little paint and new vintage hardware. I stored it and Bonnie came over and sanded and painted. I think it's a looker. We'll be taking it to the Tustin Flea Market and hopefully it will find a new home. Saturday I started doing my taxes and cleaning the garage. When I got bored with one, I worked on the other. Alas, both are not done...oh well. Saturday evening I went and visited with a dear friend Matina, who lost her husband a year ago. We planned to go to dinner so I decided we should have a little happy hour first. I brought my bottle of Margarita's already mixed up with tequila and mix. Only $10.99 for a liter at Costco....the Kirkland brand, good stuff!! We talked and "sipped" and had some fun. 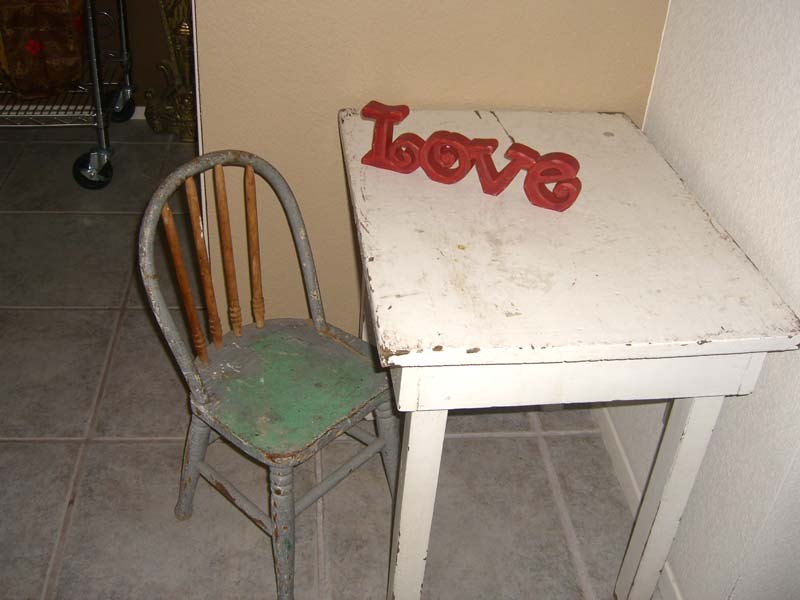 She knew I had been eyeing her little vintage chair in her garage for awhile but I know she doesn't give up things easily (who doesn't :} and if it held memories for her I didn't want to take it from her. She had been thinking about it and decided to give it to me with one caveate, I CAN'T SELL IT!!! I would NeVer. This chair was hers when she was 6 years old, oh my......I told her my only wish is to see a picture of her in that chair as a child. Wouldn't that be cute? I think so. And, yes, we did go to dinner. Sunday I went to a class at PaperTales with Rita and her sister-in-law Christie. We made a ring pin cushion taught by Sabrina. 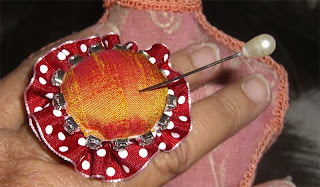 She does beautiful hand work and I worked hard on my pincushion but I know now why I funked Sewing in school. It's not my thing, too tedious for me I guess but all our rings came out pretty darn cute. To see the others run on over to Rita's blog, she took lots of pictures of the rings and the store. Art and Soul "The Week that Was"
June, my good friend, accompanied me to Art and Soul. While I took classes, she tried out the spa and read poolside. We stayed at the Green Valley Ranch in Henderson. This is a beautiful resort and I would go there again in a heartbeat. On Monday, no classes. We rented a car and hit the thrift stores of Henderson and Vegas but really decided California thrift stores have more "gold" than Nevada. We did go downtown Vegas to see where the Pawn Stars pawn store was. Have you seen this show on tv? We decided to take a lunch stop and asked "JACK" June's GPS for some restaurant selections and we decided on Mustang Sally's. As we drove there we wondered if it was a out-of-the-way dive because JACK seemed to be taking us to an industrial type area. We arrived at a Ford dealership and there was Mustang Sally's. A hip 50's type soda shop. The food was good and the decor great. Apparently, the owner of the Ford dealership built the restaurant as a way to give customers a free lunch after buying a car but word is out and people come for good burgers and shakes. I took a class from Thomas Ashman handcrafting a glass journal from glass and wire. My hands were sore but beautiful product and get techniques. I would always recommend a class with Thomas. I also took a class with Ty and Marcia Schultz in making molds and pouring hot metal to make beautiful charms. Fun class with great take aways but I fear, too expensive for me to do in "real life". I also took the Whimiscal Music Dog with Julie Haymaker. Fun class and Julie is just so good at what she does. The class turned out beautiful paper clay doggies and whimiscal music boxes. Great fun! Whew! that was fun can't wait for another. I have been here in Henderson, Nevada 3 days now and having a great time. I decided I will do the posting to my blog in increments because there is just so much and I know I will never really capture what is happening but it's FUN! There was a vendor show Sunday night, one of the reasons why we came sunday instead of Monday. Unfortunately there were only 10 vendors but it was still fun and some amazing art. I got to see some of the artists I will be taking classes from so that was nice. Trish of Vintage Bliss was here and she is so sweet and I admire her attitude of always being pleasant and always trying to bring "the bling" and great vintage finds to all the shows she does. I bought just a couple pieces vintate metal for use in art but was so happy to see "all things vintage" and "all things artistic". Fun Show.....tomorrow (if I get to it),A litle about Monday which was no class just running around and then about my Tuesday class with Julie Haymaker, Whimsical Musical Dog. I apolizgize for the pictures, I forgot to bring my camera from the room and used my Iphone so not as good as they should have been but at least I caught some pics.